Protect Your Floors with Andersen Floor or Entrance Mats from Dura Wax! Anderson Floor Mats protect your wood, tile and low pile carpeting with the best made mats in the industry. Unlike cheaper vinyl mats from big box stores, Andersen mats are made with rubber; they won't curl or crush over time and are thicker to hold more water and dirt. With a variety of colors, sizes and types, we are sure you will find the mat you need to keep your school, office or retail store looking good for years to come. Many of these mats can be used indoors or outdoors. See the difference in Person! Stop by our store and you can see and feel the difference of our Floor Mats vs cheaper ones seen at office supply or big box stores. 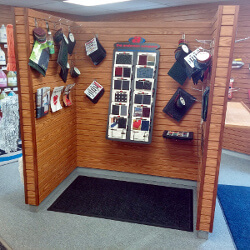 We have samples of all the entrance mats, anti-fatigue mats, wiper mats and custom printed logo mats.